On our recent trip to California the luggage rack on the EVC made so much noise that I finally climbed up there and took a look at it to see what the trouble was. 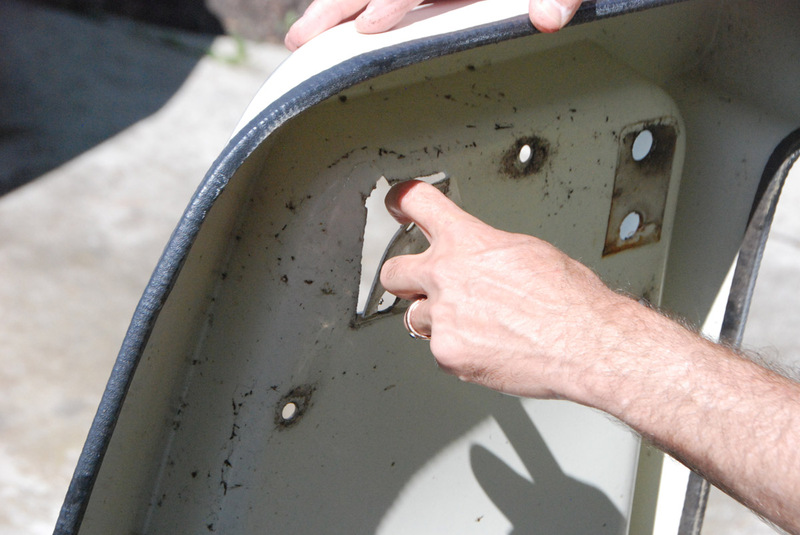 The recessed corners of the plastic shell had cracked, thus making the rack’s connection to the Eurovan pretty flimsy. Even driving slowly through town, the noise was horrendous, like some roof-mounted troll thought the EVC was a piñata. I duct-taped the rack and ordered the repair kit from GoWesty. Below is an account of my repair, which was as involved, time consuming, and difficult as I dreaded it would be. But now it’s done, and – most importantly – silent and way more resilient than Winnebago, in keeping with the American manufacturing credo of “barely good enough,” designed it to be. This was the easiest part. GoWesty’s instructions are simple and worked just fine: unbolt everything and remove the rack. What I saw after the rack was off was disgusting. Filth, slime, cracking silicone, and rusted, twisted metal brackets. I cleaned everything, let it dry completely, and then drilled the rivet heads off the original brackets so I could remove and replace them. 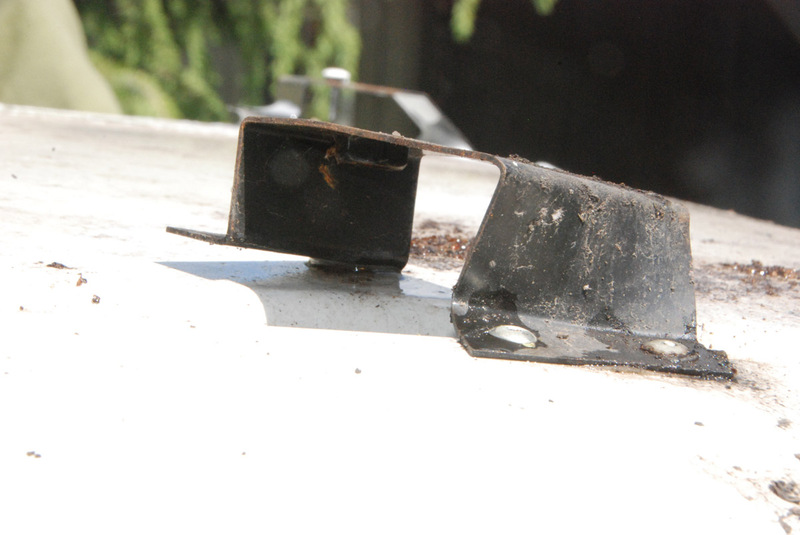 Winnebago only riveted the outside of each bracket; the inside was “glued” onto the roof and the glue job on every bracket had long ago failed. 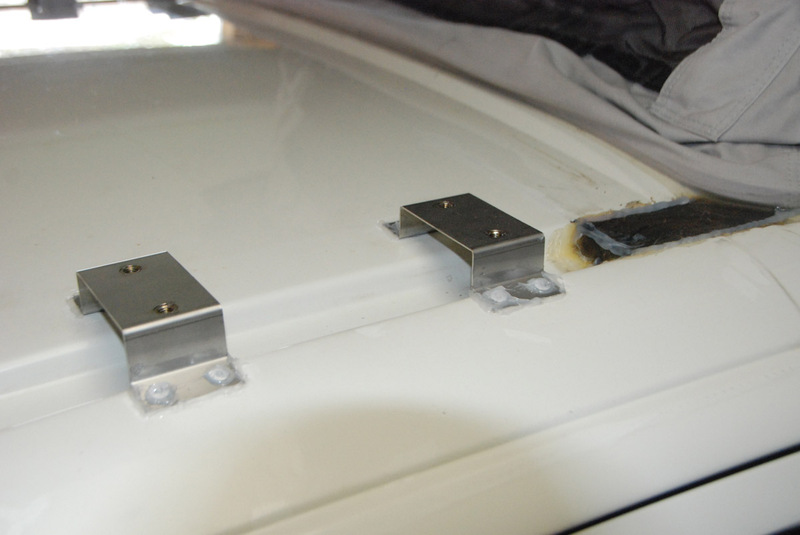 Winnebago filled the channel on each side of the Eurovan roof with a block of plastic which they siliconed or glued in place. I’ve read about this being a major leak-point for the campers, and sure enough big cracks were opening up around the edges of the plastic blocks. I scrubbed the cracks and filled them with clear silicone. Since I’d had good luck with JB Weld on other plastic repairs (e.g., the battery cover under the hood) I decided to use it on the luggage rack. I cleaned the plastic, sanded the areas around the cracks, and cleaned it all with acetone. I applied generous amounts of JB Weld to both the top and the bottom of each crack (waiting about 12 hours for the bottom to dry before turning it over and doing the top), making sure that I covered the long crack extensions at each corner. After the top had dried completely (24 hours), I painted the dark gray JB Weld with touch-up paint that I got from an auto paint store (paint code: R902, Arctic White). They mixed the paint while I waited; the dealer wanted twice the amount ($25) and two weeks to order it! After repairing the cracks, I removed the old seal, which had rusted extensively on the inside, since there were bare metal clips holding the seal in place. I sanded and acetoned the edge of the plastic to remove the rust stains, and then installed the GoWesty replacement seal. This seal has a rubber bulb on one side, and the instructions didn’t indicate whether the bulb went on the inside or outside, so I called GoWesty and they got back to me quickly, indicating that the bulb goes on the inside. After installing it, I could easily see why: it forms an actual seal (unlike the original) that keeps the air from getting under the rack and buffeting it. The original seal and the shoddy material and installation of the original brackets allowed the rack over time to get buffeted to the point of cracking at the corners. UV damage also contributed, as the plastic is pretty brittle now. To install the brackets, first I siliconed the bottom of all four holes, then placed the bracket over the existing two holes. I installed the first rivet too loosely, which meant drilling it out and redoing it; luckily I had purchased an extra box of 3/16” rivets as GoWesty supplies only the exact number of rivets required (20). I learned from my mistake that to get a tight rivet you need to squeeze the rivet gun incrementally to get the full pull on the rivet. It took me two or three incremental pulls (squeeze, open the rivet gun handle, “swallow” the rivet back down to the head, squeeze again, “swallow” and squeeze until it breaks off the disposable rivet shaft). After riveting the bracket into the two existing holes, I drilled (3/16” bit) the two inside holes. On the first one I went clean through the headliner. There is very little space between the roof metal and the headliner, which made drilling the other 9 holes quite nerve-wracking. 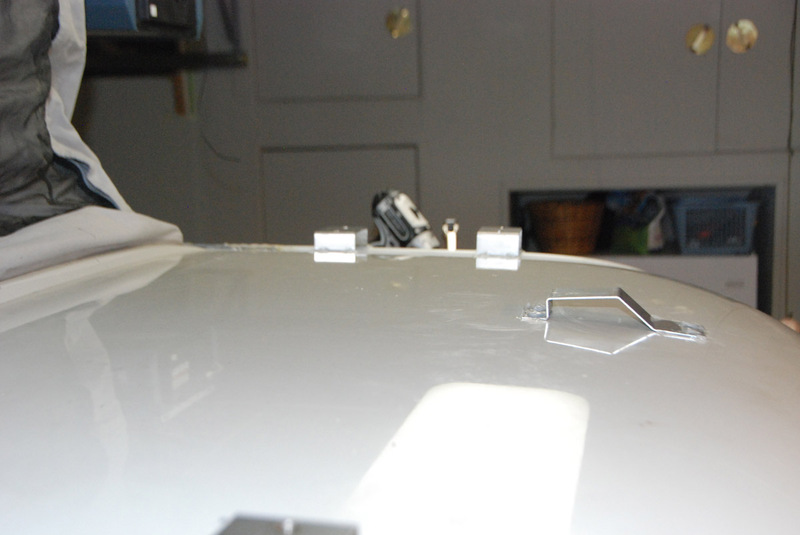 Despite being extremely careful and drilling very slowly, I still made four holes in the headliner. Not much you can do there (anyone have a suggestion to prevent and/or repair the holes in the headliner?). Once all brackets were riveted in place I siliconed over all the rivets and leading edges of the brackets to keep water from getting into the holes and leaking through the headliner. To my horror, after looking at the photos I’d just taken of the newly installed brackets, I realized I’d installed the front bracket backwards! I had to drill out all four rivets and re-install that bracket, which didn’t take me long since I’d improved my skill level with the rivet gun. After dismantling the rack, I sanded and repainted the rusted top brackets that secure the plactic shell to the roof-riveted brackets. Re-installing the entire rack was pretty straightforward, but required some elbow grease to get the holes in the plastic lined up with the threaded holes in the brackets. I bolted one side down loosely, then had to pull pretty hard on the other side to get those bolts threaded. I’m sad to report that my time-consuming JB Weld job on the cracks failed at the two front corners, which were the biggest cracks in the rack. 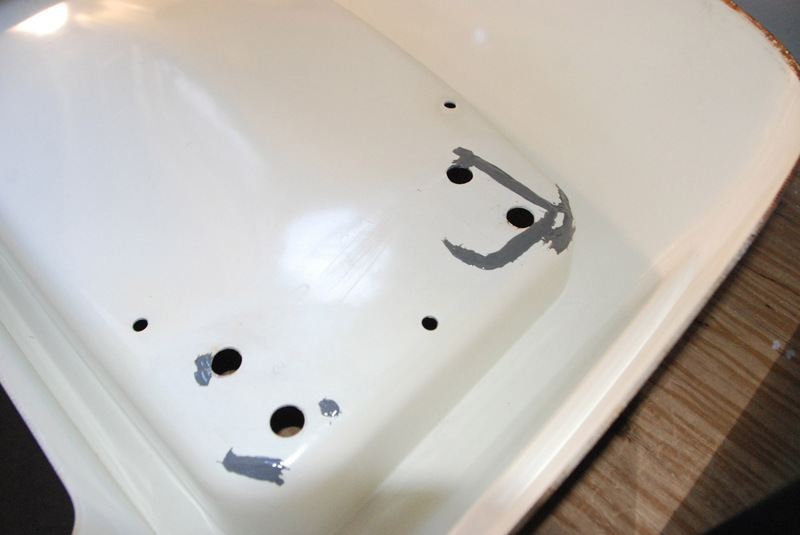 The back corner repairs held, and the top brackets have enough surface space to hold the plastic securely in place. After tightening the top brackets I siliconed the cracks in the front corners and can only hope they’ll last and keep from getting bigger. Since the rack isn’t vibrating and getting buffeted like it did originally, I’m optimistic. In the meantime, I’ll keep my eyes out for a flawless replacement plastic shell (haven’t had any luck finding one yet; any suggestions are welcomed!). The impetus for getting this job done was an impending trip to the Olympic Peninsula. I’m happy to report that the damned thing was silent the whole trip, even during near-hurricane force winds in a couple spots. The cracks don’t seem to have grown, and I’m relieved to have this one behind me. Whether I’ll actually use the rack is another matter! Nice job. Great pics. Thanks for the post. 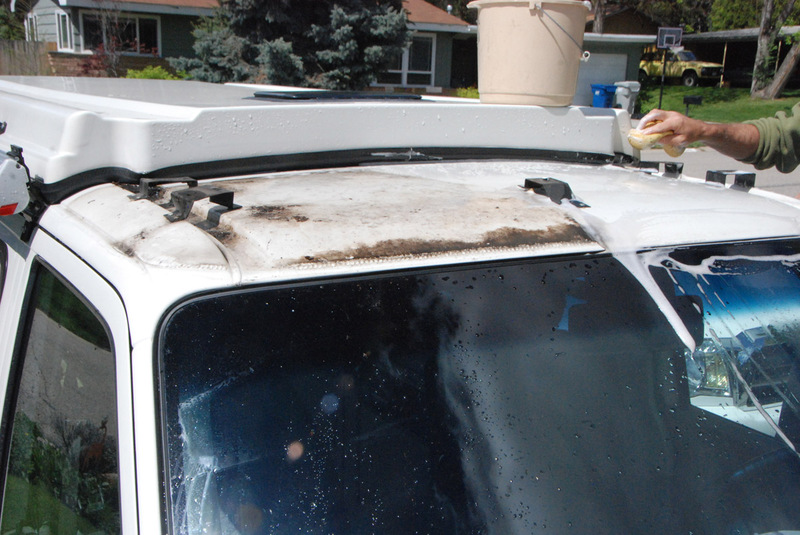 As far as a new rack if the cracks widen, it appears you could line the underside of the plastic rack with sheets of fiberglass impregnated with resin available at any auto parts store. 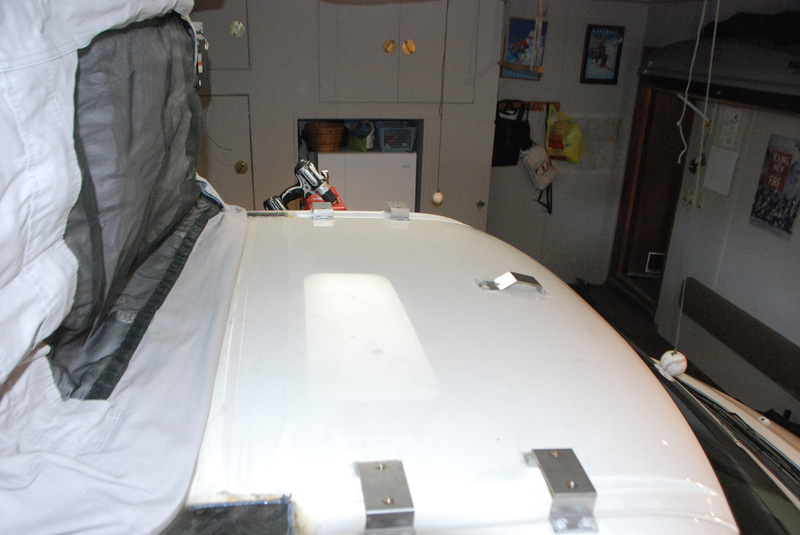 Similar to a boat repair or any fiberglass repair. Enjoy the road! Thanks, Steve. That’s just what I’m about to do. When I was a kid I made skateboards with fiberglass sheets and resin, and figured that would be the way to go on the luggage rack. I’ll post some photos when I’ve got it done. Hi Vince, thanks for your comment. I don’t think there would be any issue driving without your luggage rack shell, except for likely noise at higher speeds. Go Westy would be the folks to ask, though, if you were really concerned. Good luck on the repair job! Thanks Bob. I’m in Boise too and I enjoy your blog. Our luggage rack just failed and blew off at 70 mph on the way to Portland for Christmas. It is toast, so I’ll have to buy a new one from GoWesty or directly from Winnebago. The plastic completely failed all the way around the brackets and handles, leaving two large holes in the base of the rack. I didn’t have much noise since I’d replaced the seal with the GoWesty seal aboput three years ago. Surprisingly, the original brackets seem to be in good shape. But I will probably replace them as you did. I would not recommend the bulb seal for the luggage rack. It will keep water in and over time cause rust. You need a gap under the rack to allow the water to drain. You can push the original type seal down to where there is no gap or it’s almost touching the roof. The rubber bulb will trap water in. Thanks for the article. It is very informative. 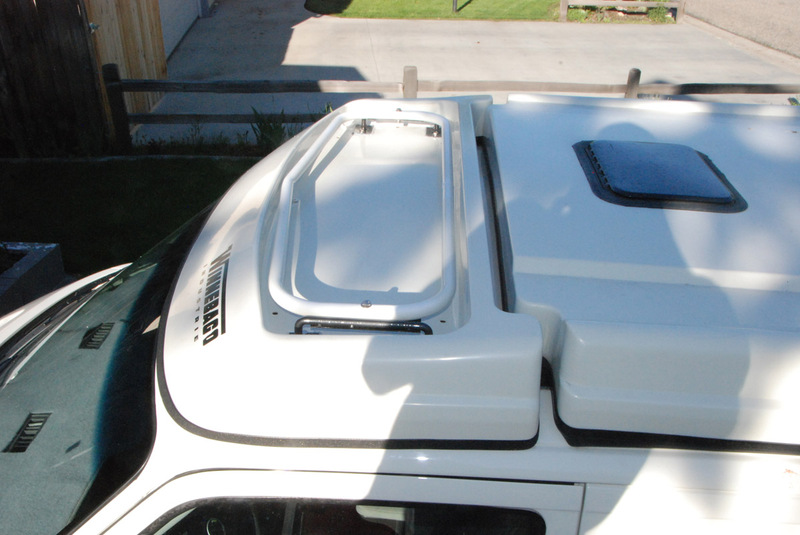 Do you know the type of plastic of the Winnebago EuroVan luggage rack? I don’t know what kind of plastic; guessing ABS. GoWesty could tell you, though, if it’s important. This article was super helpful and I’ve referenced it several times as we’ve taken a while to get our repair done. 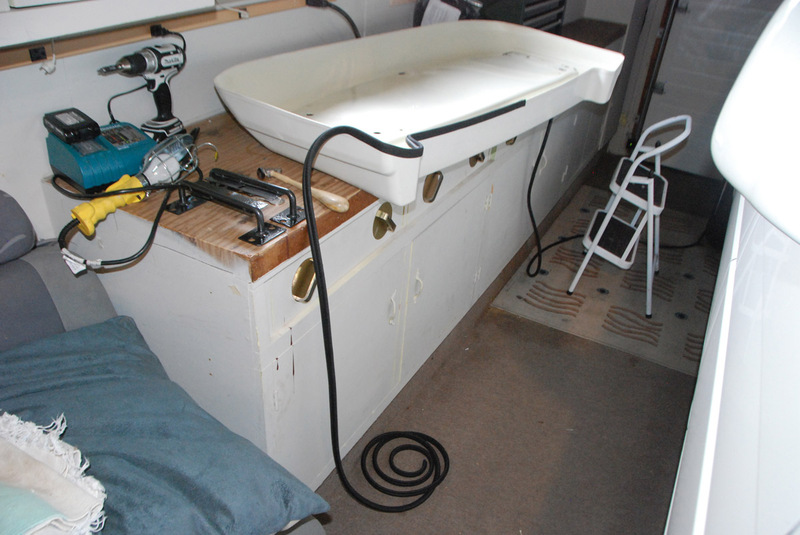 We didn’t have the “towel bars” that attach to the brackets and hold the roof down and had to get them fabricated. 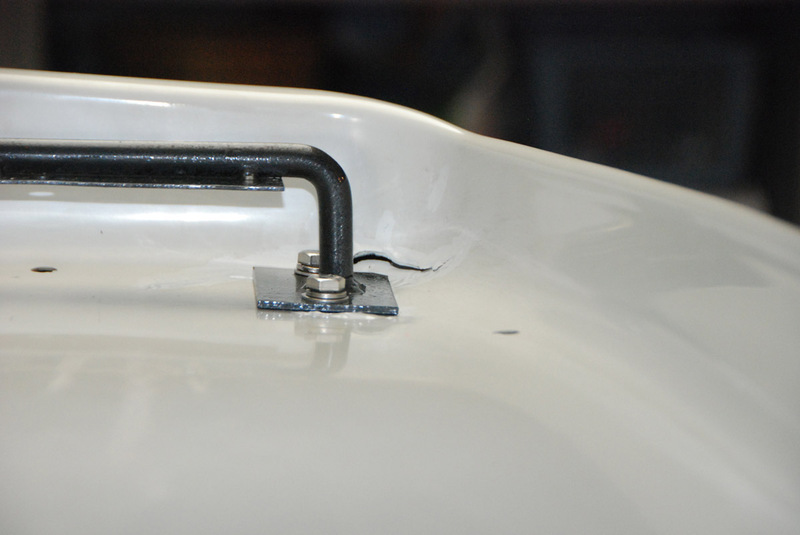 Question for you: we’re just now able to try to put it all together and there is a 1/2″-3/4″ gap between the top of the bracket and the bottom of the plastic roof. Did you find this too? Did you just tighten down the bolts to get it snug? We’re afraid we’ll break the Fiberglas. Any thoughts? We’re considering getting some spacers to put between the two. Thanks again for writing all of this up! Thanks, Laurie. We sold the EV a few years ago, but I do remember there being a gap between the bracket and the plastic roof, and I just tightened it down. I’m not sure it was as big as your gap, but I was careful to keep from bending it too much. It seemed okay when I tightened it all down. The one thing that didn’t work was the JB Weld to fix the cracks, and I did end up fixing that with fiberglass and resin, which worked great (I even reinforced the corners that weren’t cracked). Anyway, thanks for the comment and good luck. I kind of wish we still had the EV but it was fun while it lasted! Thanks so much Bob! We’re just about to sell our EV. I know I’ll miss it too! Appreciate your time! Thanks for posting. I accomplished this project with confidence thanks to you. two of my brackets had come unglued, yet the rack still stayed on somehow. I dove into the project because the rain gulleys were leaking water into the cabin, so the real benefit for me was removing the old silicone (or whatever) and waterproofing the gutters under the racks. So glad it worked out, Kelly. I miss our Eurovan (but love our truck camper). Enjoy staying dry and not worrying about rust! You were lucky. Our luggage rack blew off on a windy day in Nebraska last fall. We’ve been looking for replacement ever since. Got the runaround for 4 months from”Usedsuyopsrts.com” Finally told them to take a hike and we’ve recommended our search. Any suggestions?? Yep, follow Bob’s Rec I did and it worked great. 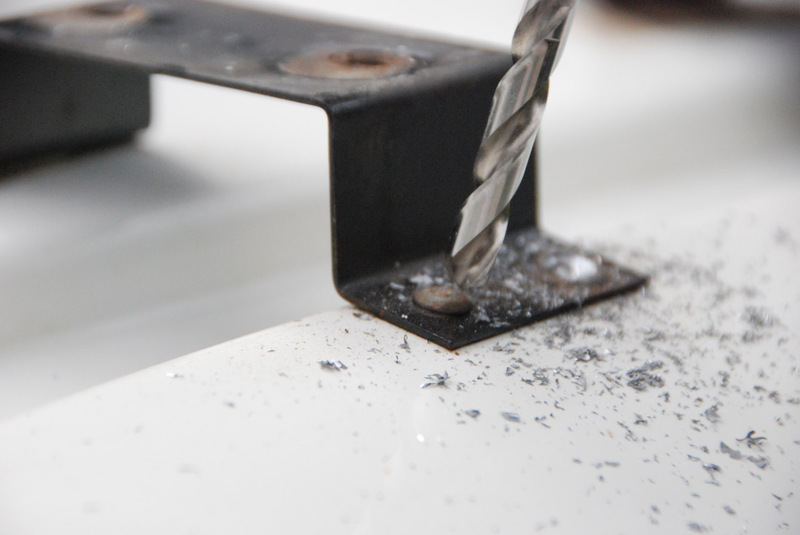 The updated stainless steel brackets are the ticket!